These three colours have surged in popularity throughout the year. It's hard to believe that we're hurtling towards the end of 2018. It feels like only yesterday that Pantone revealed its enigmatic Colour of the year, and over the last twelve months we've seen the creation of the world's most unignorable colour and a trend for bold and saturated hues. Designers and fans of colour theory are already wondering what 2019 has in store, and now Shutterstock has the answer. 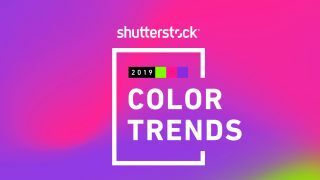 Today, the global marketplace for images has released its 2019 Color Trends report based on pixel data and image download data. By studying the actions of its users, Shutterstock has been able to identify the top three universally popular colours, as well as pin-pointing local favourites from different countries from around the world. And just as we saw with the rise of vivid hues back in the summer, it looks like people can't get enough of turbo-charged colours if this report is anything to go by. According to Shutterstock's data, a trio of neon colours have surged in popularity year-over-year and look set to shape 2019. The three colours in question include; Proton Purple, a vivid colour that "represents the palpable positive charge of our daily lives"; UFO Green, which "evokes lush countrysides alongside whirling rows of binary code. It’s both natural and supernatural"; and finally Plastic Pink, a sizzling colour with lots of depth "that captures the electric glow of cities at night". Check out the colours in the visual report below, along with the most popular colours from countries all over the world. "Whether it’s conscious or not, the colours we choose to represent any given occasion reflect more than just current trends in fashion or design – they have a larger cultural significance," said Lou Weiss, CMO of Shutterstock. "If we look to the ideas influencing culture today, technology stands at the forefront. There's tons of energy driving this movement, so it's no surprise that the top trending colours pack a real digital punch."